Sure, you may be saving a couple of calories by reaching for that diet soda, but it’s possible you’re getting them from elsewhere instead, according to a new study. University of Illinois researchers looked at the dietary habits of more than 22,000 U.S. adults over a 10-year period and found that on the days people drank diet or sugar-free drinks, they ended up eating about 49 MORE calories from “discretionary foods,” e.g., fries or cookies. Well, they don’t really know the answer to that yet, but there are some theories. It’s possible people don’t feel satisfied or satiated after consuming zero-calorie drinks, so they reach for something else. 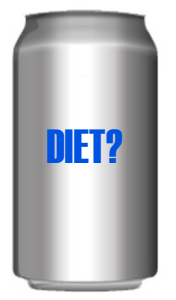 There’s some thought that because they drank a diet drink, they don’t feel as guilty going indulging in something unhealthy later, or the reverse, they ate something not so good, so they choose a diet soda thinking that will make up for it. Whatever the case may be, it’s something to think about. If you do go for that zero-calorie sweetened beverage, you may want to be more mindful about your other choices.